The competition winner, sharEd, provides low-income schools in India and Bangladesh with educational materials. 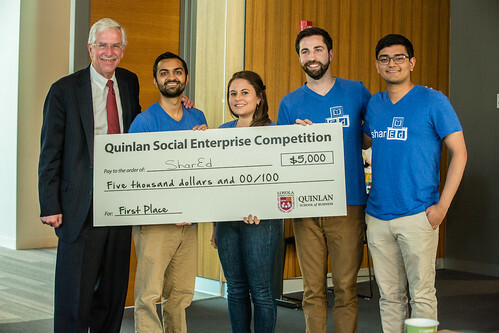 Quinlan awarded $10,000 to business plans focused on social enterprise at the fourth annual Social Enterprise Competition on April 9. The competition, headed by Quinlan senior instructor Michael Welch, encourages an entrepreneurial spirit focused on the common good. The competition also allows those interested in social enterprise to come together and share their thoughts and experiences in trying to expand this concept into more kinds of businesses and locales. From all the submissions, first-round judges narrowed the field down to five finalists. The remaining groups then presented their business plans to a new panel of judges, who asked questions about their organizations and their plans for implementation. For both rounds, judges came from across the business community. All the first-round and final-round judges were Loyola alumni. Nin Desai, NinVentures LLC CEO and Quinlan alumna, served as a finalist judge and keynote speaker. The competition had a distinct international flair. “Most of the plans had a national or international scope, and among the finalists, the plans described organizations that would work in countries including India, Kenya, and Peru,” Welch said. Business plans were also submitted from around the world. Kulisha, the second place winner, included students from Brown University, the University of Michigan, UCLA, and the University of Nairobi. View photos from the event in the gallery below or on Quinlan's Flickr page.